Organizers and lawmakers rally protesters on Thursday, Feb. 8, 2018 at the federal government’s Open House regarding Offshore Drilling. SACRAMENTO (CN) – With the federal government plotting new offshore oil leases, California lawmakers and environmentalists have coalesced around a clear goal: Keeping big oil off California’s coastline. Californians flooded the state Capitol Thursday, eager to participate in the only statewide public hearing -for nearly 40 million residents- outlining the Trump administration’s plan to subject their coast to new federal offshore drilling operations. 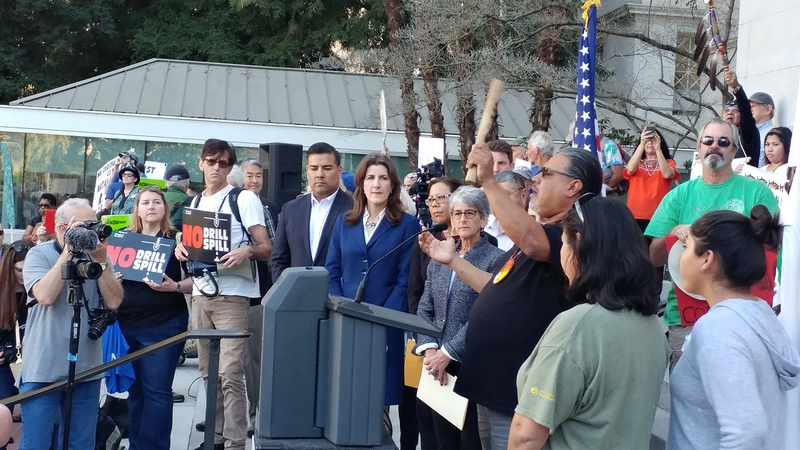 What the activists found in downtown Sacramento was far from a standard public hearing; there was no opportunity to engage federal decision makers and no chance to amplify their concerns about selling new California offshore drilling leases for the first time since 1968. The federal government’s presentation caught most off guard. Motivated by preventing oil spills and other disasters, the civic-minded crowd bused in from the pillars of the world’s sixth-largest economy, including contingents from San Diego, Orange County, Los Angeles and San Francisco. Prior to the bureau’s open house held a few blocks from the Capitol, elected officials primed up the crowd, taking turns jabbing the president. “The Pacific Ocean is not just another piece of property for you to drill 18 holes in,” said California State Controller Betty Yee to hundreds gathered on the steps of the Capitol. “President Trump has hooked his wagon, he’s hooked his wagon to the dinosaurs of American industry in coal and oil,” said state Sen. Mike McGuire,D-Healdsburg. The Trump’s administration’s January announcement that it was considering a five-year plan to open up federal waters to drilling jolted California and other coastal states. Legislators proposed a ban on new pipelines and piers in order to make it harder for the oil industry to process their product, and on Wednesday via bipartisan vote they asked U.S. Interior Secretary Ryan Zinke to remove California from the leasing plan as he did for Florida. Zinke’s proposal lays out a plan for 47 potential lease sales. The department foresees seven lease sales in the Pacific region, comprised of six off the California coast, and one that will be split between waters off the Washington and Oregon coasts. There have been no sales in the Pacific since 1984 and none in California since a catastrophic oil spill in Santa Barbara in 1969. The Santa Barbara blowout is widely known for spurring the modern environmental movement and dozens of other coastal cities have enacted stringent zoning restrictions on oil and gas facilities. Offshore oil drilling expansion has never been more unpopular in the Golden State, even before Zinke’s announcement. According to the California Public Policy Institute, which has asked respondents “do you favor or oppose allowing more oil drilling off the California coast” every year since 2003, a record low 25 percent of California adults favored oil drilling when asked in 2017. Despite public sentiment and a ban on new drilling in state water, oil production continues to flourish off the California coast. According to a Consumer Watchdog report, state regulators have extended over 200 new permits for existing leases under Gov. Jerry Brown while the industry operates more than 1,300 total offshore wells. With no open microphone, the bureau encouraged people to watch a seven-minute informational video and invited them to peruse what many described as “big oil propaganda.” Afterward participants could submit written comments on laptops or in paper. The bureau told Courthouse News the open house format was more inclusive than a traditional hearing and allowed people to talk one-on-one with bureau employees. “This is democracy in play,” said John Romero, bureau public affairs officer. He said hosting the open house in Sacramento, nearly 100 miles from the ocean, was not meant to discourage participation or slight the state’s liberal cities but because the bureau chose to host hearings in capital cities. Anti-Trump rhetoric dominated the day, with Californians promising to defend against another catastrophic coastal oil spill. The favorite to replace Brown in 2019, former San Francisco Mayor Gavin Newsom said the state will do whatever it takes to freeze the oil and gas expansion. “I am resolved that not a single drop from Trump’s new oil plan ever makes landfall in California,” Newsom said in a statement.